The Osto-EZ-Vent, a venting device, is a leading Ostomy product for any type pouch; one piece, two piece, drainable, or closed end. Easy, quick access makes the Osto-Ez-Vent a better alternative to burping or opening the bottom, less mess, less bother, more security. This ostomy product was designed without a filter for faster air release. The Osto-EZ-Vent was specifically designed without a filter to quickly release air build up on demand aiding in reducing pouch explosions, and wafers pulling loose. Because it is not a filtering device the Osto-EZ-Vent works efficiently, lasts as long as the pouch, it does not become ineffective in water, fits on any pouch, and it is easy to install and use. Osto-EZ-Vent, the #1 preferred air release method Colostomates and Ileostomates --- is air build up a concern? 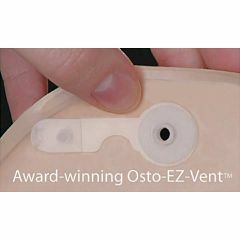 We have addressed this problem with the Osto-EZ-Vent: an air release vent for any manufacturer's ostomy pouch. Easy to access ostomy vent. Gives user freedom to be as active as they wish. Wearer can swim, bathe, golf, garden, play tennis, travel, hike, take long walks on the beach, etc. Lasts as long as the wearer wears the pouch. Lightweight. Just what I been looking . Good for releasing gas.. I use it after each pouch change and it is so easy to get to the EZ vent once applied correctly than having to open the bottom of pouch for relief.Makes my life with the colostomy better. This is good for ostomy bags that don't have efficient ways to release gas. I used this product for 1-piece bags. It was useful when the built in air filters wouldn't work (after showers). However, I no longer use this product because I have switched to a 2-piece system with closed end pouches. Do not need to use them for that. Air filters on those work and change the bag twice a day. I love these, easy to apply andwork like a charm MUCH MUCH easier then trying to burp the wafer and less hassle. Easily vents gas in bag. Best way to punch the hole is with make-up type scissors which have a small sharp point. Just don't poke hole in opposite side of bag when using. I use an awl. After applying the ez-vent to the outside of the bag, I insert the awl through the stoma hole and puncture the bag from the inside into the hole in the ez-vent. Push the awl in as far as it will go. Thereafter, if the vent gets clogged, I use a young toothpick to clear the hole from the outside. There are instructional videos on youtube. When I helped my mother do this, I think we used a ball point pen to poke the hole through the bag. You could also use a knife tip but be sure to not push the knife or pen tip through both sides of the bag otherwise you'll have a place for the EZ-vent and a second, unwanted hole in your bag. Don't use a hole punch or anything that would make a hole larger than one eight of an inch. A hole smaller than one sixteenth will likely clog if liquids make contact. you go through the big hole of your bag and turn it inside out, use the tip of some sissors to pock the hole from the inside out. turn the sissors around to make sure you have a clean hole. thats it. I hope this helps I've been using EZ vents for a long time and will not use anything else cause they work.